What do I think about the cover design? I don’t know if you can hear the heavy sigh coming from my mouth. 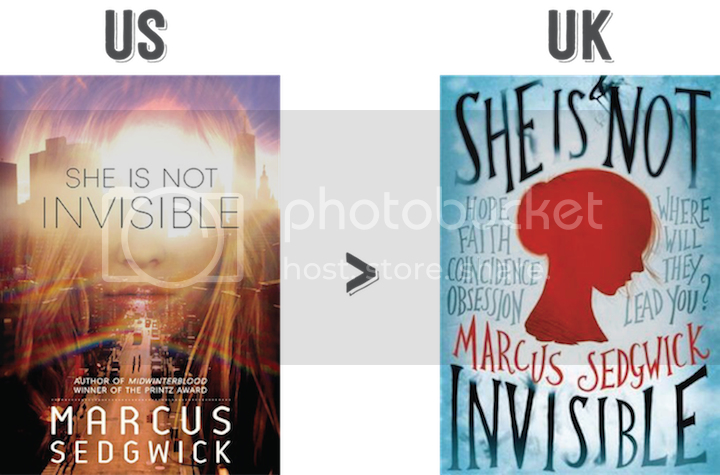 I am disappointed that the US cover of She Is Not Invisible isn’t that great. I’m honestly not surprised either. The two things I really like on the cover are: 1. the sun lens flare (it’s blinding almost as if it’s referring to how the main character is blind, and shedding light.) and 2. the font used for the author’s name (I am into the sharp angles for the curves in the letters. It makes me think of hexagons). Would I buy this book based on the cover? Nah. I’ll pass. What do I think about the cover design? Guess who’s in love with this cover? THIS GIRL, RIGHT HERE. I’m extremely envious that the UK gets this amazingly gorgeous cover. Just look at that! The typography, guys! So beautiful. The coloring and the lettering make the cover stand out to me. I love the smoky effect of the lettering, almost like it’ll disappear. Whoever designed this cover made good use of the space by wrapping the lettering around the orangey-red silhouette girl. It doesn’t look too crowded or overwhelming. The lettering looks like it was made for this cover, and I love that! And the silhouette with the wisps of hair hanging down is such a great detail. The girl isn’t all prim and proper. The blurring around the edges of the book bothers me a bit because I just want the typography to be crystal clear, but it’s a nice effect and it does somewhat fit with the synopsis. Would I buy this book based on the cover? Yes, yes I would. Which cover design do you prefer? Would you buy the US or the UK one? How do you like how this post is formatted? « TOP TEN TUESDAY | TV Shows I Love With Awesome Friendships! I’m taking a break from my 2,000-word photo prompt to say YES. YES TO EVERYTHING YOU SAID. I like how colorful the cover is and how smoky and beautiful the font is in the UK cover! I would definitely buy it based on the cover alone. I agree with you, the UK cover is definitely prettier. So eye-catching! But I have sad news! The UK paperback for this one? It’s the US cover. I don’t know why they decided the original wasn’t good enough. I think someone said it’s not as representative of the story as the other one? But meh. I’m not a fan. I’m glad I have a copy of the hardback version! I’m not a fan of both covers, but if I would get one I would go for the UK one! I’m not a fan of floating faces. Like Mel, I’m not a huge fan of either cover but I definitely think the UK one looks a lot nicer than the US one. The US cover just looks extremely busy to me with the layering and effects and while the UK cover isn’t my favourite cover ever, it is pretty! I would not hesitate to buy the UK cover over the US cover at all! I don’t have a strong preference for either cover, really, although if push came to shove I’d be more inclined to go with the UK cover; it’s just that bit more unique. But I was in Waterstones today, and they were stocking the US cover! I’m not really sure why, since this is, you know, the UK! I’m not someone who’s visually minded but I do usually have a cover preference. I do have to say that I’m not the biggest fan of either cover. Funnily enough, when I looked at the covers my first reaction was to be drawn to the US cover. I think I like it a little bit more than the UK edition just because I like the colours on that one more than I do on the UK cover. I LOVE the UK cover! I first saw it on a blog post among a bunch of others and it just stuck out to me. It draws the eye to it. That cover makes the book look amazing. The US one makes it look . . . mediocre. There’s a big difference on the impressions each leave on me. I definitely prefer the UK cover! I saw that US version in a shop over here (I’m in London, Hi!) the other day and that’s one of the reasons I didn’t buy it. I mean, it’s not awful, I kinda like the colours, but other one just looks cooler. Oh my Cee, you should see the physical hardback of the UK cover it is so lovely, the texture is a soft matte and yeah totally amazing. I don’t quite understand why there has to be two different sans-serif typefaces on the US cover, surely just pick one and use the different variations it offers?